Let us talk about Volodymyr again. Seems lately this patient has been appearing in our publications the most regularly. 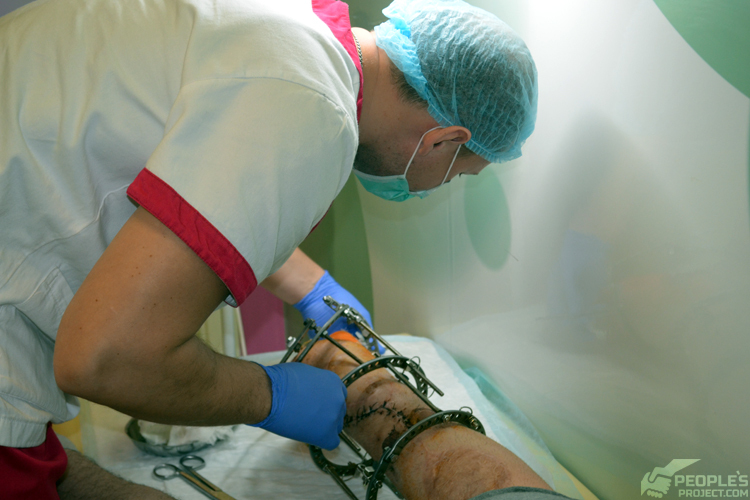 Right away, the period of active restorative work on his injured leg is going on: recently Volodymyr underwent another surgery, and a few days ago he got sutures removed from his leg. Volodymyr got wounded in 2015 near Vodiane where he served with the 93rd Mechanized Brigade. His foot had been severely injured by a shell in an enemy mine explosion – the heel bone gone entirely torn off, and the soft tissues heavily damaged. At a state hospital, they healed the wounds but failed to restore the bone, so they released Volodymyr with his leg crooked. German military medics did not succeed to restore the foot either; they just recommended to Volodymyr wearing special orthopedic footwear, and that was all. Unfortunately, conventional medicine lacks means for restoration of such a defect – even transplantation of a patient’s own bones will not help as there are no such big “spare” bone fragments in the body. 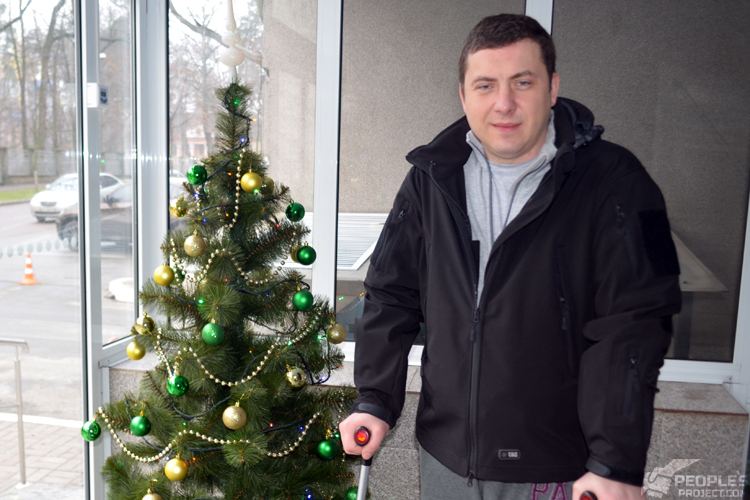 It is only the Bioengineering Rehabilitation for Wounded project that proved to be effective for Volodymyr. The doctors of the Project started with minor tasks: they got the defected zone prepared for further transplantation, then formed up a proper bone out of the man’s own stem cells, and transplanted it into due place. Apart from this, they put a lot of work into the soft tissues: restored natural form of the foot, and filled the missing fragments of the skin and subdermal tissues with transplanted pieces. This might have been the finale: later, Volodymyr foot had been intended to remain fixed with a stiff connective structure, that is by means of arthrodesis, as the ligament responsible for the foot’s movements, had been joined exactly to the missing heel bone. But superbly luckily for Volodymyr, the doctors noticed a tiny remaining fragment of the heel bone on the remainders of the torn ligament. This petite bit allowed to apply cell technologies and to connect the ligament to the heel bone in a natural way. 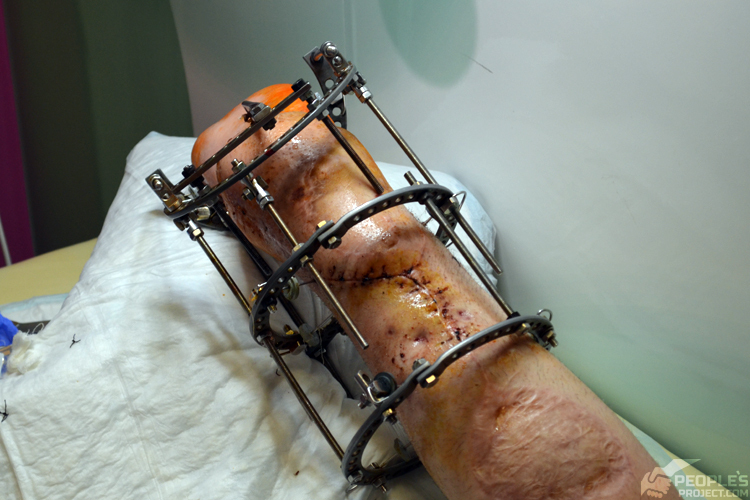 That is why the surgeons had to re-assemble the ligament and to clear it from adhesions; later they stretched it out to match its natural length, using the Ilizarov apparatus – now you can see it on Volodymyr’s leg; soon the ligament is to be attached to the guy’s heel bone. 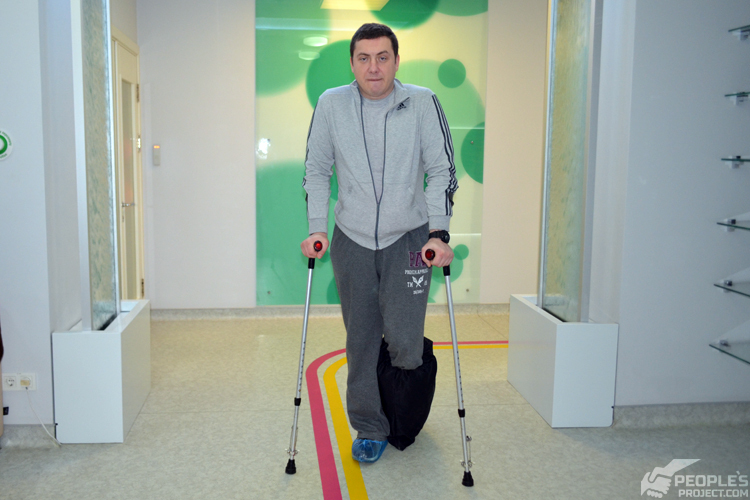 This will allow Volodymyr to undergo a course of rehabilitation aimed to enable him to move his injured but entirely healed leg, in full. Maybe all the bills for Volodymyr’s treatment has been already paid by the volunteers of People’s Project, but the Project’s other patients still urgently need our assistance. The initiative is a charitable, non-commercial organization, so it exists at the account of people’s donations exclusively; besides, there is still no slightest hope for the state’s support so far, so our shared efforts and common work make the only option enabling us to help our wounded fighters. So dear friends, please stay supportive to our injured defenders, as sometimes even a small donation, just a few hryvnias contributed to their treatment, makes a huge difference in their life.